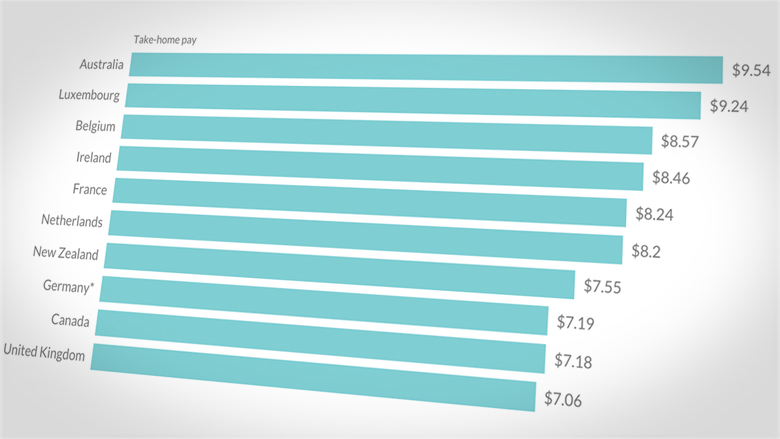 Click image to see how your minimum wage stacks up. Low wage workers in Australia have it better than most. The country has the most generous national minimum wage in the developed world, according to a report from the Organisation for Economic Co-operation and Development. The report ranked 27 countries that have laws setting a nationwide minimum rate of pay. 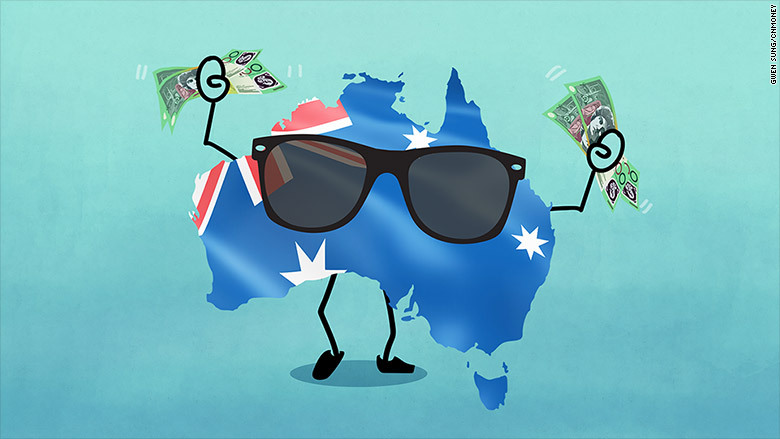 Australia's minimum wage workers -- aged 21 and over -- make 15.96 Australian dollars per hour. After tax and other deductions, that's equivalent to $9.54, once the difference in the cost of living is taken into account. "They have a high minimum wage. And interestingly they have a low tax burden," said Herwig Immervoll, the author of the OECD report. "[Australians] recognize that supporting low wage earners through the tax system is important." Other countries have set higher hourly rates but they also tax minimum wage workers more, leaving them with less in their pockets. Australian workers on the minimum wage make the equivalent of $10.38 per hour, which works out to $9.54 after tax. The U.S. ranked 11th on the list, with a federal minimum wage of $7.25 per hour. That leaves workers with take-home pay of $6.26 per hour. However, the U.S. would move up the rankings if state minimum wage rules were factored into the equation. Roughly half of U.S. states have rules ensuring workers are paid more than the federal minimum, Immervoll said. The OECD report shows that a single Australian minimum wage worker with two kids could work just six hours per week to lift themselves above the poverty line, because they would also receive state benefits. In the U.S., the same worker would have to clock in 50 hours per week to escape poverty. In the Czech Republic, it would take 79 hours of work per week. Eight countries, including Finland, Sweden and Switzerland, were not included in the report because their governments do not set national rules on minimum pay. Many of them have strong labor unions and established arrangements for collective bargaining, which means governments don't have to step in. Countries with the lowest take-home minimum wages include Latvia, Chile and Mexico, which is bottom of the list with a rate of about $1 per hour. -- An earlier version of this article incorrectly stated the U.S. federal minimum wage was $7.85. It is $7.25.